CHRIS EUBANK JR. (24-1, 19 KOs), Champion, Brighton, Sussex, UK 167 ½ lbs. “King” ARTHUR ABRAHAM (46-5, 30 KOs), Challenger, Berlin, Germany 1684 lbs. ‘Lightning” LEO SELBY (24-1, 9 KOs), Champion, Barry, Wales, UK 126 lbs. JONATHAN VICTOR “Yoni” BARROS (41-4-1, 22 KOs), Ciudad Mendoza, Argentina lbs. KID GALAHAD (22-0, 13 KOs), Champion, Sheffield, Yorkshire, UK 125 lbs. JOSE “El Tigre” CAYETANO (21-5, 10 KOs), Challenger, Tijuana, Mexico 126 lbs. ROBBIE DAVIES, JR. (15-0, 11 KOs), Champion, Liverpool, Merseyside, UK 139 lbs. MICHAL SYROWATKA (18-1, 6 KOs), Challenger, 18-1 (6 KOs) 139 ½ lbs. (Additional fights or highlights may be shown, time permitting). 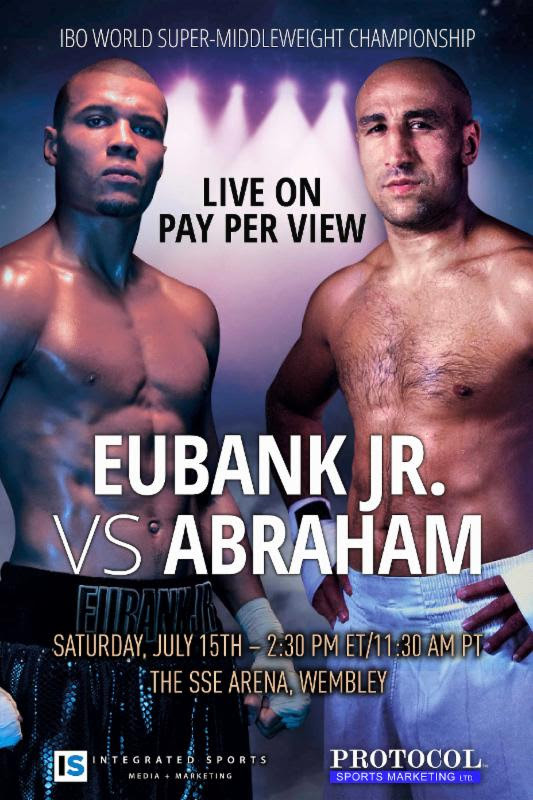 LIVE AIRING: Integrated Sports Media will distribute “Eubank Jr. vs. Abraham” live in the United States on cable and satellite and online PPV, starting at 2:30 p.m. ET / 11:30 a.m. PT ,via iN Demand, Vubiquity, DISH and FITE TV for a suggested retail price of only $29.95. Outside of North America, “Eubank Jr. vs. Abraham” is being distributed to broadcasters worldwide by leading boxing television rights distribution firm, Protoco Sports Marketing Ltd. In Canada, the event will be available on television to fight fans that subscribe to premium pay television network Super Channel. Contact the local cable provider to subscribe to Super Channel and all that it offers, including premium series, movies and much more, for as low as $9.95 per month.